March 20th Eclipse at 09:42 from South Lakes with 230mm lens. I admit I’ve been lucky with domestic eclipses so far. I vividly recall seeing the summer eclipses of 1972 and 1973 from my junior school playground (something much too dangerous to risk with today’s kids, apparently) using old pieces of film as filters. I can place the memory precisely in time because for some reason I remember all the girls in my class being obsessed with Donny Osmond at the time, following those (cough cough) wonderful hits like Puppy Love. 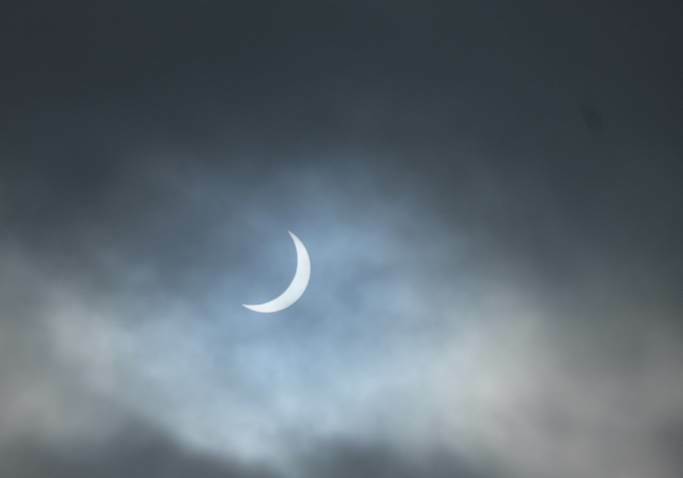 For the 1999 eclipse, I seriously considered sneaking into Cornwall on my motorcycle to avoid the gridlock, but settled for bunking off from my job at BT in Wolverhampton and watching the show from my summery Hertfordshire garden. That 1999 eclipse was lucky for me because Cornwall was a cloudy damp squib, whilst I saw the whole thing (minus totality of course) – preternatural dusk and cold, odd breezes, disoriented birds, strange eclipse-shaped shadows everywhere, the sun becoming a brilliant thin crescent. I was hooked. I suppose my eclipse luck was due to run out (as luck generally seems to in middle age). So for this one, I hauled myself out of bed to find that days of clear sunny weather up here had somehow turned into a dank overcast on the morning of the eclipse - March 20th. The locals were so disinterested they were filing down the lane for their papers without so much as a glance skywards. The radio was determinedly trying to get into the spirit of things with Holst, some symphony by William Herschel (who was a musician first) and (inevitably) that Sky at Night music by Sibelius. But, nope, out of the window it was all grey badness. That might have been the end of it, but in fact it did clear miraculously to give us a few glimpses through thin cloud (actually great for partial eclipses cos you can risk direct naked eye viewing). I got some photos too and we had one glimpse early on through the solar-filtered Questar. Not so unlucky in the end, then, and my teenage daughter even got over her natural ‘whatever’ long enough to start researching the next ‘proper’ one – I have to take her to Hawaii in a couple of years apparently. Details of my eclipse observations follow, if you’re interested! 0730 – 0800 Got Up. Radio 3 playing some symphony by Herschel. Sky completely overcast. 0815 – Brief glimpse with solar-filtered Questar through cloud. Nothing yet. Solar disk appears clear. The Questar is a pain because this one is ancient and has no filter over the finder, so finding Sol is trial and error! 0830 – Better view with the Questar; Sun briefly almost clear of cloud. Small chunk now missing from the disk. It’s started! 0832 – Radio 3 refuses to play much requested ‘Total Eclipse of the Heart’ by Bonny Tyler. Good call! Still cloudy. 0850 – Thick cloud, but noticeably cooler and dimmer now. Birds still twittering normally, though. 0853 – Neilsen’s Helios Overture on the radio. But no sign of Helios! Arrrgggh! 0905 – Dark and gloomy with thick cloud. Jackdaws not bothered yet. I watch a couple with my Zeiss 7x42s – they’re trying to manoeuvre a huge twig into my neighbours’ chimney pot. 0908 – Very brief glimpse of the Sun, with more than 50% gone, through cloud with naked eye and binos. Took a few snaps. Family excited (for once). 0912 – Jackdaws now huddling against preternatural chill. Really getting quite weirdly dim: feels just like 6 am dawn. 0918 – Drizzling, misty, need lights on in house. 0924 – Local street lamp comes on! 0926 - Just a sliver of eclipsed sun through clouds! Must be close to that 95% maximum now. Daughter squealing with enthusiasm – her usual ennui has vanished for once. 0932 - Like deep dusk. Cars driving with headights on. Jackdaws roosting in the tree opposite. Birds generally quiet now. Surprisingly cold. No eclipse breeze noticed this time. 0940-0943 - Cloud thins at last! Great views and lots of pics!! 0950 - More views and pics through thin cloud. Ambient brightness almost back to normal. Birds twittering again. Air warming fast. 1000 - Cloud thickens again. No further sign of sun. But now I’m in the mood to go eclipse chasing in a year’s time (if I can afford it). 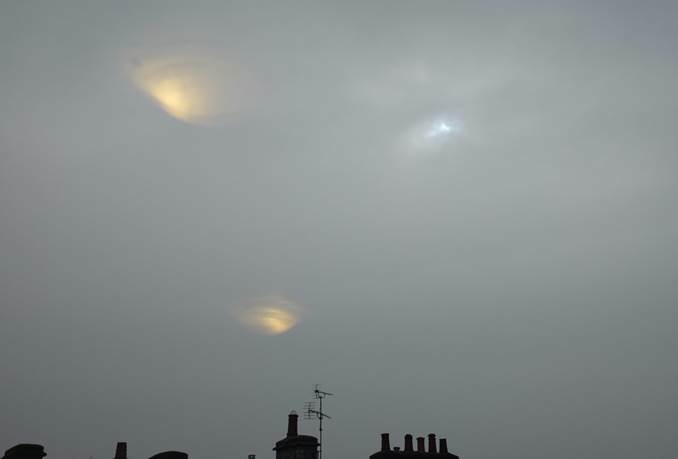 Strange cloud effects near eclipse maximum at 09:25 March 20th 2015.